Finally Part 2 to this series! You see part of my haphazard, spontaneous personality in this blog don’t you. So many projects I’ve yet to finish: CBD Good Eats, the ever on-going macaron rage, Cupcake Craze, Travel (Sigh so many great eats in taiwan, hk and Vietnam never made it! ), and media invites. Anyway for your reference, part 1 can be found here. Cupcake Craze part 3 will be a US special so look out for that! Above is their hummingbird cupcake which will be around only for this month of July! Can’t rmb the exact ingredients but I do remember that the flavour profile is very light and tropical. 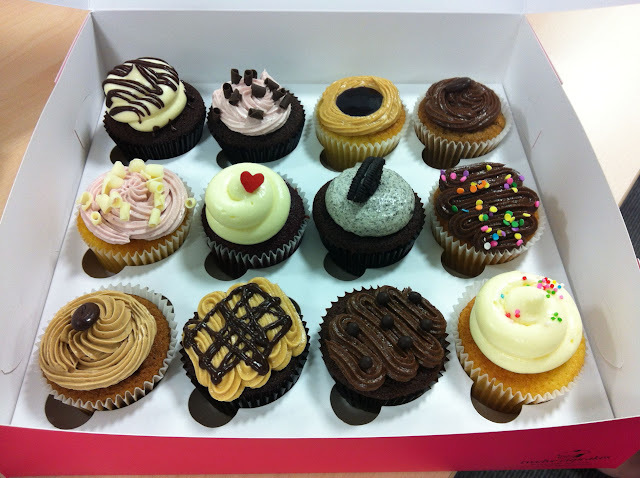 It is pretty evident that lots of thought are invested into each and every cupcake. The disk you see there is something like a thin coconut sable. Crisp with nuanced coconutty flavours, it makes the whole cupcake even more texturally complex than what it already is. Flavours here are really rich so share if you must! One of the better renditions I’ve tasted. No red food coloring here, color comes from beetroot juice (same as cedele) but yet the beetroot flavour doesn’t overpower- i still get the cocoa. I’m not a fan of red velvet (I agree with Florian Bellangar in Cupcake wars, besides the insane amount of food coloring red velvet is an ordinary weak chocolate cupcake with cream cheese frosting -.-) but this was pretty okay. Overall I think MP does great cupcakes. Their cake bases are all moist yet fluffy, and their frosting’s not too sweet. If I had to compare with all the other cupcakes I’ve ever eaten I think MP strikes the best balance in terms of sweetness in their frosting. Best of all they are huge so no worries about having not enough cake! That said I would love to see a greater variety of cake bases. The three I had had similar textures in terms of the cake so I’m assuming the same recipe was used with tweaks flavour-wise. I had the Strawberry Chocolate ($3) and it was delicious. Soft, moist chocolate cake- check! Smooth, velvety strawberry buttercream- check! Frosting was not too sweet and had a really refreshing flavour to it. Won’t be surprised if fresh strawberries were pureed for this. However I find that their cupcakes are quite boring. It’s just cake with frosting. It’s not cored and filled with stuff, there’s no crunch element, flavours are a little predictable. In essence, it’s not as exciting to eat. I gave a sterling review for PV previously but their maple pecan disappointed just a little bit. The cake base is perfect, light and moist but different from all the rest of their cupcakes. And that glazed peacan? Awesome stuff. But the frosting is way way too sweet. You know there’s too much sugar inside when you tap the frosting with you fork but it doesn’t stick.